The synagogue is temporarily located next to the medical archive complex. In the future there is a plan to move the location of the synagogue to a permanent and more appropriate location. 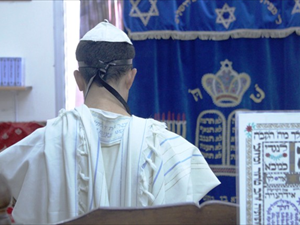 synagogue every day at 13:30 in the takes place "Mincha"
On Saturdays - "Mincha" and "Arvit" - at the commencement of the Sabbath. "Shacharit" - at 07:30 AM and "Mincha" an Hour before the end of Shabbat. For details, please contact with Mr. Joseph Cohen - The responsible for religion and "Kashrut" in the hospital, Phone 050-6267088.